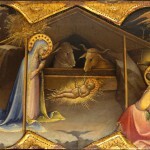 Welcome to our collection of drawings, paintings and illustrations of the Holy Nativity. You’ll find images of Mary, Joseph and Jesus along with angels, wisemen and kings. Much of the artwork in this category is not from children’s books but from famous artists, many of whom lived during the Renaissance. Gathering Christmas and Nativity images has been an interesting journey. Each artist has put their own interpretation on the story of the Holy Birth. Some include images of the crucifixion and others simply portray the great joy on both heaven and earth of the birth of Jesus Christ. If you are looking for Christmas images that remember the real reason for the season, you’ve come to the right place. Each year it becomes harder and harder to find Christmas cards with Nativity drawings. Why not make your own from the wonderful collection of vintage Nativity images here on Reusable Art? 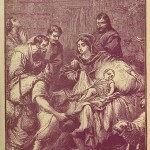 Beautiful vintage Christmas engraving of Jesus asleep on the hay as shepherds come to adore their Lord. Beautiful wood Christmas Engraving of the Nativity by the French artist Gustave Dore. 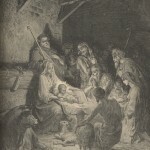 Shepherds and others have come to see Christ and celebrate his birth. 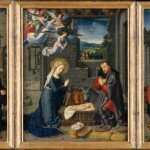 Beautiful adaptation of the Holy Nativity by Pierre. The 18th Century, French artist filled his painting with love and light in one of his prettiest works. Beautiful Christmas triptych painting of the Nativity with Donors and Saints Jerome and Leonard by the artist David Gerard (ca. 1455-1523). The Nativity by Giovanni, painted in the 1300s features gold accents on the mantles, the baby Jesus and the angels who have come to witness the holy birth. 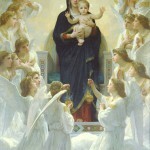 Beautiful Christmas painting by Bourguereau of The Virgin with Angels. Would make a lovely Christmas card image. Beautiful colored painting of the Nativity celebrating the birth of Christ. 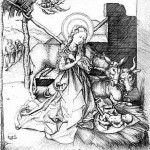 Beautiful Nativity engraving by Martin Schongauer (ca. 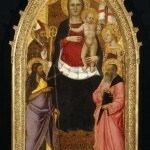 1450-1491). 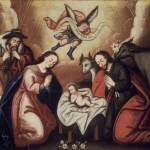 It features Mary and Jesus with an ox and a mule looking on. 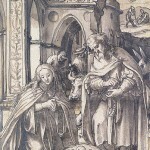 Nativity painting by Hans Holbein, the Younger. Would make a wonderful classic-style Christmas card. The Nativity by Federico Barocci an Italian Renaissance (c. 1526-1612). Barocci shares with the world his interpretation of the birth of Christ. 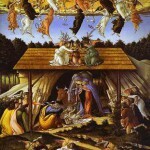 Painting by Sandro Botticelli depicting angels and men celebrating the birth of Jesus.